Sounds like an easy question doesn’t it? And it is, if you know the answer. As I reflect on my journey over recent years, moving away from working in an industry I wasn’t passionate about and moving towards being paid for doing something I believe in, this question has come up time and again. It is so simple, and yet it is fundamental to achieving what you want in life. My guess is, if you are not working on something you truly love, then you haven’t answered this question. It was three years ago now and we were sat in the garden, talking about life. My girlfriend asked me “what would you love to do with your life?” I reflected on the question and noticed how uneasy I felt. I didn’t have an answer. I didn’t know what I wanted, and I felt really uncomfortable about that. At that point I had been in a corporate job for 8 years. It had been great for me in many ways: I’d learnt a lot, I was getting paid good money and I was working with a great group of people. But, I wasn’t happy. I knew it wasn’t for me. And, if I was completely honest with myself, I’d known that for a long time. Years in fact. So why had I been doing it for so long? Well, the answer is in the question at the start of this article. I could have written you an extensive list of what I didn’t like about what I was doing: working in an office, working in an industry that was contributing to the destruction of the environment, working 9-5 with little flexibility etc etc. However, I could not have told you what I wanted, I didn’t have an answer to the question “what would you love to create?” So what? Why does that make a difference? We see what we are focused on and we hear what we are listening for. You will have many references for this; like when you decide to buy a new car, and then you start to notice that model everywhere. Or if you’ve ever looked to buy a house, all of a sudden you notice the FOR SALE signs everywhere. The cars and the signs were always there, but you didn’t notice them until you had them in your mind. Your reality is shaped by your thinking. When you start to get clear on what you want to create, you will start to notice ways to achieve it. But surely it can’t be that easy I hear you say? I promise you it is. The first step to creating the life of your dreams is having an idea of what that would be like. How would you know if you had it? If you woke up tomorrow and life was exactly as you wanted it to be, how would you know? What would be different? What you be experiencing? How would you feel? What would you see in your world that would tell you you’d achieved it? I invite to you to take some time after reading this to reflect on these questions. It’s a fun exercise, it doesn’t take long and it feels good! Take a minute to think about how you would like your life to be. What would you like to have happen? Use the power of your imagination to visualise your future reality, hear the sounds of that playing out in your ears, notice the feelings you have in your body. Because when you start to develop a sense of what you want, the path towards achieving that starts to become clearer. Three years ago when I was sat in my garden I hadn’t done that exercise, I hadn’t seriously thought about it in that way. And then I started thinking about it. I started focusing on what I wanted to create rather than what I didn’t want, and amazing things started to happen. Ideas started to come, opportunities began to present themselves, new relationships began to open up. My reality began to change. Getting clear on what you want to create is the first step towards making it happen. And, you probably realise that there is a lot more to it than that! You will probably need to learn some new skills, build new relationships, challenge some of your existing beliefs and, most importantly, take action. It’s not easy, and having some support can make a massive difference. I work with people who are taking positive steps towards the future they want to create. 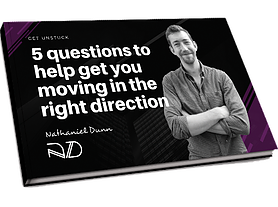 If you are doing that or are ready to, and you want some support, then reach out to me at nathaniel@nathanieldunn.com.au. Because it’s a team game.